As students return to school and the temperatures and leaves begin to fall, coffee lovers turn their attention to all things pumpkin spice. 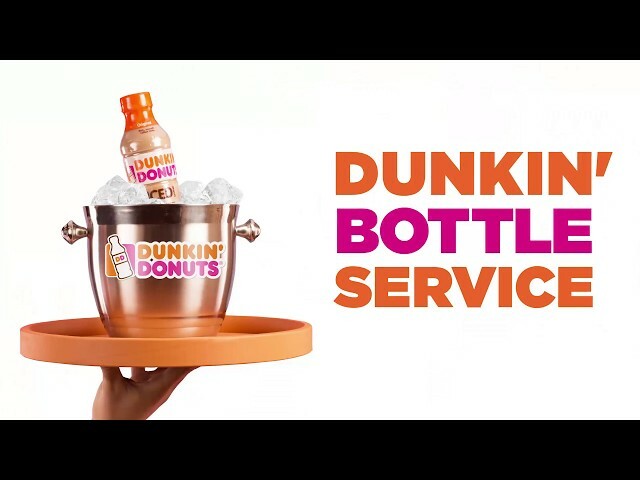 And this year, Dunkin’ Donuts is giving fans more ways and more places to fuel up with their favorite fall flavor with the launch of bottled Pumpkin Spice Iced Coffee. The latest addition to Dunkin’ Donuts’ fast-growing line of ready-to-drink (RTD) iced coffee beverages is available for a limited time at grocery, drug, convenience stores and mass merchandisers nationwide. Made according to Dunkin’ Donuts’ specifications with high-quality Arabica coffee blends and real milk and sugar, Pumpkin Spice bottled iced coffee delivers the quality and great taste that millions of guests have come to expect from Dunkin’ Donuts’ signature iced coffee served at its restaurants worldwide. Produced and distributed by The Coca-Cola Company and its bottling partners since 2017, Dunkin’ Donuts bottled Iced Coffee beverages also are available in Original, Mocha, Espresso, French Vanilla and Cookies & Cream. Dunkin’ Donuts offers one of the largest varieties of pumpkin choices of any national restaurant chain – from iced, hot and frozen coffees, lattes, cappuccinos, macchiatos and Americanos, to donuts, muffins and MUNCHKIN® donut hole treats. Dunkin’ also offers Pumpkin flavored K-Cup® pods and Pumpkin flavored bagged coffee where groceries are sold. Dunkin’ debuted its pumpkin donuts and muffins in 2003. Pumpkin-flavored coffee and espresso beverages hit the menu in 2007. Sales of the company’s pumpkin and pumpkin spice-flavored items are up 45 percent from 2013 to 2017, according to Nielsen data. “Pumpkin has stayed steady over the years as a seasonal favorite because it’s a classic taste that fits so naturally with our coffee and bakery offerings as taste buds shift gears from summer to fall,” said Paul Racicot, director of culinary innovation, Dunkin’ Donuts. In fact, sales of pumpkin and pumpkin spice-flavored items are up 45 percent from 2013 to 2017, according to Nielsen data. Dunkin’ Donuts bottled Iced Coffee was recently named an IRI New Product Pacesetter brand, awarded to “game-changing innovations” with a new line of coffee offering the quality and great taste that millions of Dunkin’ Donuts guests have come to expect from the brand’s signature iced coffee served at its restaurants worldwide.